A couple of days ago I made the cutest candy corn hand sanitizer cover. 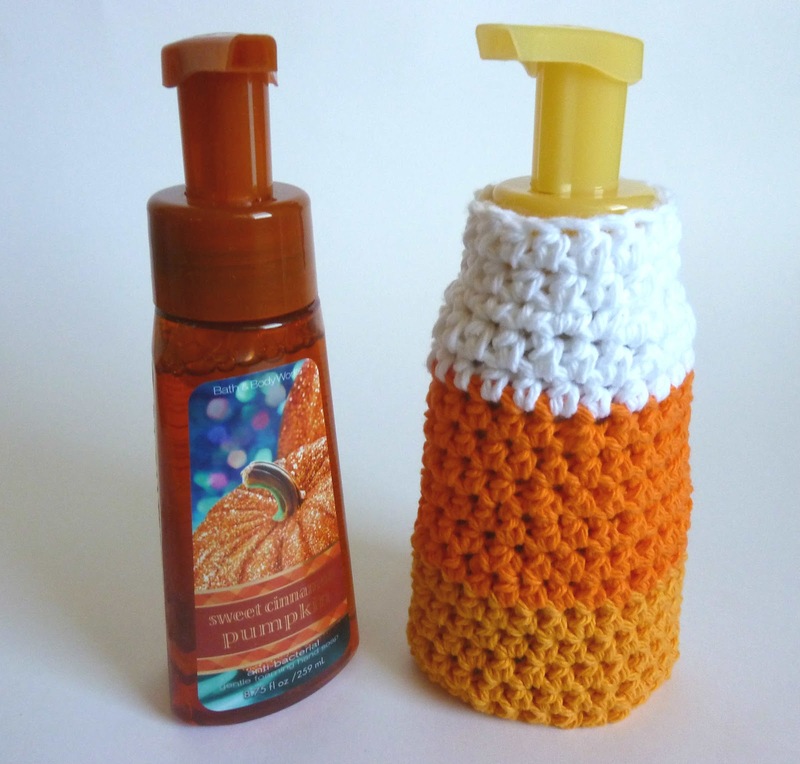 It occurred to me that it would be super fun to make a full-sized soap dispenser cover in candy corn colors, so I whipped one up using my Bath and Body Works foaming soap cover pattern. It turned out HUGE! Ahahaha! I guess the Bernat worsted weight cotton yarn is larger than the Lily Sugar'n Cream worsted weight cotton yarn I had used for those covers. I would have caught the problem much sooner if I had tried it up to the bottle at any point while I was crocheting the cover, but I didn't, so I had to remake it. Since I had already crocheted one in single crochet (and my F hook has gone missing...), I decided to make the new one with half-double crochet stitches. I like it! As a bonus, it crochets up wickedly fast. Using yellow yarn, ch 26. Being careful not to twist chain, sl st to first ch to close loop. Fasten off. Weave in ends. 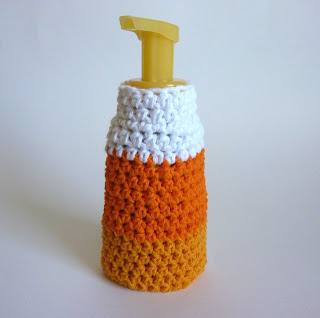 Slip cover over soap dispenser and enjoy the candy corn goodness! One more thing about candy corn: I am a rather lazy decorator. I don't like to haul out boxes of decorations for each holiday, swap them with the previous decorations, and lug the boxes back down to the basement. I am just not that type. So I like multi-holiday seasonal decorations. Candy corn is a perfect decoration, since it works as a general fall decoration. It's just as appropriate for Halloween as it is for Thanksgiving. I can put it in the bathroom in September, and I don't have to put it away until Black Friday. Perfection! I love candy corn!